DNA testing is the latest trend in genealogy. 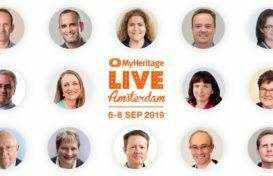 Join the head of MyHeritage DNA, Yoav Naveh, as he explains the fundamentals of DNA testing at MyHeritage. In this webinar, you’ll learn how to gain insights into your ethnic origins and further your family history research using MyHeritage DNA and our simple and inexpensive DNA test. Click on the video below to watch the full webinar. Don’t forget to check our other webinars for many more genealogy tips to help make family history research easier. Have ideas for future webinars? Let us know in the comments below. In order to make the DNA more useful for the users and knowing that it is possible to extract more information from the raw data besides the genealogy information, it would be great if we could get somewhere a list of SNPs which are extracted in your DNA kit! Thanks a lot! Please see our recent Q&A about DNA: https://blog.myheritage.com/2016/11/myheritage-dna-your-questions-answered/. Accorting to geneological publikations I am a descendant of some tartar prince from BlueHorde moving to Russia in the beginning of the fourteenth century.